Marijuana contains Delta-9-THC, an element that is toxic to cats, dogs, and horses. After the passage of recreational marijuana laws in Colorado and Washington State, and as more states across the country introduce new legislation regulating the production and sale of cannabis, it is important that pet owners are aware of the dangers marijuana poses to their pets. According to the Animal Poison Control Center, a division of the American Society for the Prevention of Cruelty to Animals (ASPCA), reports of pot poisonings in pets have sharply increased by about 30 percent between 2009 and 2013. But their findings likely represent only a small fraction of the number of marijuana cases in dogs and cats, NBC News reports. And this can be a big problem — the Animal Poison Control Center explains the Delta-9-THC (Tetrahydrocannabinol) element in the marijuana plant is toxic to dogs, cats, and even horses. Additional signs of marijuana poisoning include vomiting, increased salivation, dilated pupils, decreased body temperature, depression, seizures, and coma. Symptoms can become so severe that they may even prove fatal. Boulder, Colorado veterinarian Dr. Matt Booth says his practice sees on average one case of pot poisoning per month, most of which are likely cases of accidental ingestion. But La Mesa, California veterinarian Dr. Monica Keable says she and her colleagues at the Pet Emergency and Specialty Care Center treat far more — usually around one or two pot-poisoned pets every week. The great majority of cases she sees are from non-deliberate poisonings where the pet has gotten into a hidden stash of pot. Dr. Keable says even the most careful owners should educate themselves about the dangers cannabis poses to dogs and cats. “It’s not something that people think of that much. I don’t think people think their dog is going to get into marijuana but dogs love to eat things, and that’s definitely on the list,” Dr. Keable says. How do pets get their paws on pot? Experts say by drinking bong water, eating marijuana buds and leaves, and, in many serious poisonings, by ingesting marijuana edibles made with THC-laced butter. “People put weed and a stick of butter in a sauce pan and the fat soluble cannabinoids leech into the butter creating a much higher concentration of THC,” Dr. Wismer explains. Pets who munch on their owners pot brownies or cookies can find themselves in a doubly dangerous situation — poisoned by cannabis and chocolate, or poisoned by cannabis and raisins. Secondhand smoke can also be a factor, Colorado veterinarian Dr. Robin Downing tells Buzzfeed. Cats can die just from breathing in a bit of secondhand smoke. The length of the exposure, the health, the age, and the size of the animal can have a huge effect on the pet’s reaction to pot, she adds. “A 75-pound Labrador Retriever who gets into the stash, that dog is going to have a different experience than the 12-week-old, two-and-a-half-pound Dachshund,” Dr. Downing explains. In the case of the pint-sized Dachshund, Dr. Downing pulls from a real-life case she treated recently. When the Dachshund ingested medical-grade marijuana from her clients’ son, who suffers from Duchenne muscular dystrophy, the small dog almost died. What should a pet owner do if they suspect their four-legged friend has ingested marijuana? Seek help from a veterinarian immediately. 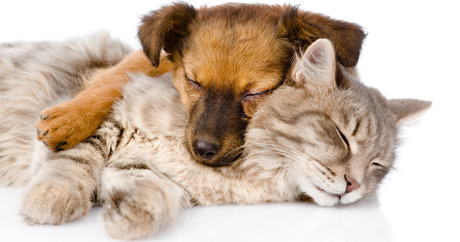 Worried owners can also contact the Animal Poison Control Center by phone 24 hours a day at (888) 426-4435.